Friends want and need truthful fashion and accessory advice. It’s hard to be clearheaded in a store with the bright lights, big displays and booming music. So when jewelry shopping with friends give your unbiased and constructive opinion on their earring, bracelet and necklace choices and they will return the favour. Your friends taste in fashion and jewelry may be different than yours, they may like vintage style necklaces, flower earrings and pretty charm bracelets and you like one-of-a-kind, or chunky bold jewelry, but give advice with their preferences in mind. Being honest and also seeing them for who they are and what they like builds better relationships and friends will turn to you for more and more advice. Which is a great thing, because with practise you can use this skill in other areas of your life. This Candy Swirl Fashion Bracelet shown above is made with big buttons, donut beads and cute square accent beads. I design jewelry for big personalities, so your individual style is brought out with this original fun fashion bracelet. Long Fab Party Earrings shown above have colorful square buttons alternating with bright fashion buttons in these daring dangles. The buttons handpicked for shape and accent details are connected with silver loops in long strands to create enticing flirty earrings. Here are some handmade jewelry buying tips for your internet shopping fun. You’ll want to see several images of your favorite jewelry choices from different angles. Check measurements carefully, but it’s preferable to buy a bracelet, or necklace that is adjustable. You want to know the fun big earrings, colorful bracelets and bold necklaces you purchase are well made and will not need repairs. If you can return items hassle free you know the jewelry designer is confident in her work. But just in case look for free repairs on the handcrafted jewelry you buy. Are you able to learn how to care for your jewelry? Is there information on the site about the materials used and how to clean them gently and quickly. Some bead finishes can be damaged with improper cleaning techniques. Vintage Red Passion Bracelet shown above has clusters of flower buttons and glamorous fire polished Czech beads in a smoldering retro Hollywood design. Look fabulous in chunky chic fashion jewelry. Fashion Star Earrings shown above on the left has a faceted golden yellow fire polished Czech bead floating inside a silver ring beautifully accented by lemon yellow buttons above and below. These trendy handmade long dangles were created for fashion stars everywhere. Drop Dead Fashion Earrings shown above on the right are long dangle earrings made with fun fashion buttons hanging from glamorous large sky blue beads. You’ll be stunningly gorgeous wearing these unique earrings that no one else has. When buying jewelry, keep in mind that when you put on a new colorful bracelet, big necklace, or fun long earrings you should only be aware of jewelry when people compliment you on it, or if you love the original design so much you can’t stop admiring it. You want a full and finished looking handcrafted bracelet that’s not bulky, or uncomfortable around your wrist, but also I’ve seen bracelets with too few beads that look unfinished. You want a beaded necklace that’s lays flat on the back of your neck, because you don’t want to deal with a collar resting uncomfortably over bulky beads and chain, and you don’t want drop earrings that are so heavy, you feel like holding them up to give your poor ears a break. Lastly your unique jewelry should be easy to put on and take off. No fashion accessory piece should be too tight, or too loose, so look for adjustable jewelry styles. Because if you have a cool jewelry design many people like, you’ll be taking it off many times so they all can try it on. 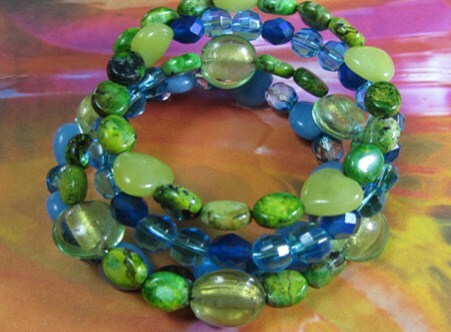 Colorful Bead wrap Bracelet shown above has many colorful semi precious beads in interesting shapes and sizes, and fire polished czech beads on four circles of memory wire in a jewelry design that glimmers with so much to look at. Cute Rhapsody Flower Bracelet shown on the right has big colorful fashion buttons and flower buttons in a jewelry design that gives your style an adorable vintage look. This fun, bold yet elegant fashion accessory is perfect for any occasion. Updated Red Diva Necklace shown on the right has plunging double layers of eye catching buttons that brings a bold edge to your style. Cool fashion buttons and flower buttons hang pendant style on long silver loops and add interest to any ensemble, so impress everyone with your new original look.